This is a very exciting week for us here on the bayou. Bentley is turning seven years old on Wednesday. This is our first birthday that we can share with all of our friends. We are really excited for this year since he has the #7 on his fur! Bentley is channeling his “inner~Oprah” by hosting a giveaway of his FAVORITE THINGS! 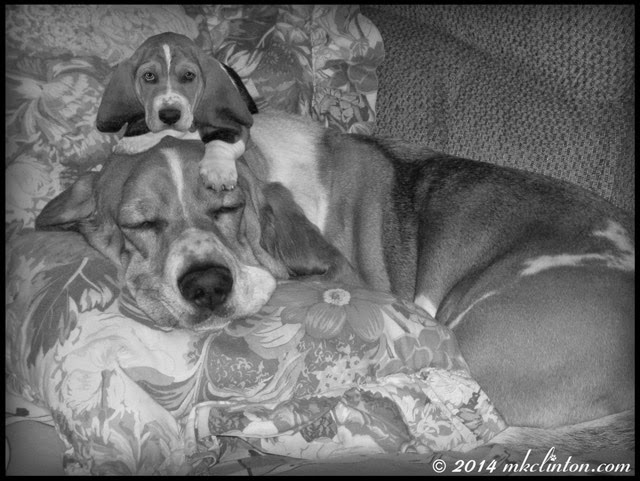 This is Baby Bentley on top of Big Boy Bentley at 7 years! Join us all week for the celebration! 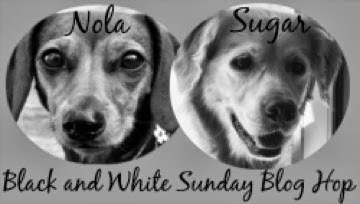 Thanks to our friends Sugar the Golden Retriever and Dachshund Nola for co-hosting the B & W Sunday photo hop. Hope ya has a pawsome birfday Bentley! How exciting Bentley, Happy Burfday for Wednesday, I just had my furst Burfday on Saturday ! You were quite a cute pup but now you are a handsome boy. You didn't change a whole lot really, just in size! What an adorable photo. This is definitely a special year for Bentley, where good things are bound to happen! We look forward to sharing in the celebration. the photo is a heartwarmer, even when you live on north pole :o) Have a great sunday! That baby bentley is the cutest thing ever, he grew up to be a handsome man. Can't wait for the festivities. Oh my...was baby Bentley not the cutest thing?!? I am looking forward to the birthday FUN! Happy birthday. Giving presents instead of getting them is an interesting concept. I had to do a double take on this picture, at first I thought you had got a puppy! Happy Birthday Bentley! Aaaaahhhhhhh....great picture!! We can't wait to help celebrate Bailey's birthday!!! Happy Birthday! Mr. N just had his birthday too. Can't wait till your birthday bash Bentley!! Oh, I love birthday pawties! That photo is precious. OMD, I am SO there Bentley!!!! I just can't wait! !